The Chicco Bravo LE can be used as a frame stroller with the Chicco Keyfit 30 or as a toddler seat for babies that can sit upright. In infant carrier mode the frame is used without the seat and canopy, and when you are ready to switch to toddler mode the toddler seat and canopy attach to the frame. The seat insert is removable, reversible, and is a multi-position reclining seat. The stroller claims a one hand fold that can self-stand. Pulling the handle under the seat causes the front wheels to swivel into position and it is ready to go. The stroller features all wheel suspension, linked brakes, storage basket, adjustable handlebar, and an extendable canopy with peek-a-boo window and flip out visor. The Bravo has a parent tray with zippered storage and 2 cup holders, as well as a child’s tray with storage and cup holders. This stroller works for children 6 months to 50 pounds if you don’t use the Chicco Keyfit 30 infant car seat carrier. The storage basket on the Bravo stroller is quite large and is located directly below the seat. It allows us to carry a lot of baby stuff. We could even fit our extra large diaper bag in the storage bin. The bin is accessible from both the rear and front end of the stroller. From the rear end it is wide open and easily accessible. However, from the front end it is covered by the leg rest, which needs to be lifted in order to access items from the basket. The storage bin has a maximum weight limit of 10 pounds. This storage limit is same for 6 other strollers that we compared with and better than 6 more. The handlebar of the stroller comes with a parent console or parent tray. The console has 2 shallow cup holders, a small zippered pocket, and a small canvas pocket. These pockets can hold very small items. We use it for keeping car keys or some cash change. The weight limit for this console is 3 pounds. A child’s tray is attached to the handlebar at the front end of the seat. This tray has 2 cup holders and a small section for snacks. The Chicco has a large canopy. It has a good quality kick out visor that provides increased protection from sun and cold. There is a peek-a-boo window on the Bravo canopy near the parent console as well as on the front end. It is netted and offers additional ventilation. The canopy can enclose the baby completely with the 2 netted windows providing ventilation during severe hot or cold weather. The rear canopy window is really a good feature as we can constantly monitor our baby through the net even while walking the stroller. The canopy scored higher than average in our review. The zippered pocket on the Bravo parent console is so small it holds almost nothing. The small hanging pouch is comparatively larger, but it neither holds that much. The only upside here is that both these pockets zipper close so you won’t lose items that you manage to fit in them. The cup holders on the parent tray are fully enclosed and non-removable. They are fairly shallow at only 1.7 inches deep. They can hold items like keys and mobile phones if necessary. They are compatible with the baby bottle, sippy cup, and water bottle that we tested. The child’s tray on the Bravo has a nice touch not all of the strollers have. The cup holders in the child’s tray is also compatible with the different bottles we tried, though the water bottle is less secure in the holder and tended to fall out depending on what terrain we went over. The recline feature on the Bravo stroller is easy to use. It can be reclined to 2 different positions besides the standard sitting position. However, it doesn’t have as good of reclining range as some other strollers. This stroller does not have an adjustable leg rest, but it is padded. The padding is thick and of good quality material. The footrest is a wide plastic rest that is relatively shallow. The seat back has a nice recline that is operated with one hand and a simple button push. It is one of the easiest in the group. The Chicco has a recline range of 70.4 degrees to 23.3 degrees. We did not find any other accessories available for this stroller, though Chicco does offer some replacement parts should something on the stroller fail. The primary function of a stroller is pushing and turning. Pushing the Bravo does not take much effort. It gives a lightweight feel, which makes it a fun experience. Although, the wheels aren’t the most attractive part of the Bravo they get the job done. Bravo comes with 4 foam filled plastic wheels, which offers easy, and quick turning. The front tires are 7 inches while the rear tires are 9 inches in diameter. The wheels did a good job on uneven surfaces and rough terrain. They are easy to push and turn on grass and gravel. We did not face any problems pushing the stroller on the park’s trail. The life of the plastic wheels is certainly lesser than strollers with rubber wheels. However, they can handle some wear and tear and are still durable for years. The wheels are smooth and don’t not have any traction or tread, which could be an issue in the snow. All the wheels have suspension and the rear brakes are linked to each other. The Bravo is thin enough to fit through any door. It helps to push it easily in tight spaces because of its narrow size. It can fit through a door as narrow as 22 inches, given that it is 21.5 inches wide. Bravo has a height adjustable handlebar, which makes it easy for people with different heights to push the stroller along. However, the range is limited to 3-position adjustments. The handle on the Chicco adjusts by rotating on side pivot points up and down. The handle does not extend like some other strollers in the group. The handlebar fits well in the hand and provides a nice grip. One important point to make here is that while folding the stroller the handlebar needs to be in one particular position in order for the stroller to stand right. Folding and opening up the Bravo is as easy as it gets. With little practice, one can get it done in a couple of seconds with merely one hand. All you need to do is reach for the handle beneath the seat and left up. From there, the front wheels automatically rotate inward to ensure a compact, self-standing fold. Bravo’s quick fold is the smartest in its class. Folded stroller is compact for travel and storage. It takes lesser space compared to others in the competition. The Chicco scored relatively higher in folding test due to its easy operable 2 step fold, self-folding and self-standing properties. The self-stand is very stable, but the foam handle might be damaged over time and will definitely get dirty from sitting on the floor when folded. The unfold requires 2 hands, but it is super easy to operate and involves only 1 step. All you need to do is grab the handlebar with one hand and the footrest with the other and spread them apart until fully open. The top layer padding of the car seat is a very soft fabric that is nice to the touch and very comfortable for the baby. This padding is also removable. The lower layer is a similar fabric, but it is somewhat textured and not as soft as the top layer, but it appears to be more durable than the removable portion of the seat. The canopy fabric of the stroller is a stronger canvas material and has a net (peek-a-boo window) along the top of each side. The storage basket is made from a thin material. The Chicco earned a 7 of 10 for safety, which is pretty good considering the high for the group is 7. The Baby Jogger City Select earned an 8 and the low score is a 4 shared by the Baby Jogger City Mini GT and the Baby Trend Expedition. The brakes on the Chicco are easy to set and release. They are linked to each other. The brakes do a great job of locking the wheels and keeping the stroller steady at one place. The Chicco has a 5 point harness that are easy to put on and remove. The shoulder strap length is easy to adjust and there are multiple shoulder height positions. The buckle itself is fairly easy to use and fasten the baby in the seat. There is a one-click release button on the buckle that releases the straps fittings apart by themselves. The Bravo LE weighs 23.9 pounds and has a folded size of 11,250 cubic inches. Though it’s not the lightest stroller in the group it is lighter than many others in its competition. Loading the stroller into a car trunk does not take much effort. However, the child’s tray sticks out when folded. The stroller fits even more compact with the tray off, but you would have to take extra time to remove and replace the tray. Bravo takes lesser space for storage compared to the strollers that fold flat. It is easy to setup the stroller. The instruction manual covers everything except how to attach the canopy. It took us about 10 minutes to get it out of the box and ready to roll. The Chicco Bravo comes compatible with the Chicco Keyfit 30 only. You can attach the car seat with the Bravo, with the toddler stroller seat installed or removed. The Chicco car seat comes with a canopy and has a pee-a-boo window like the stroller does. The Bravo comes with an adapter for easy click-in travel with the Keyfit. The Keyfit 30 clicks easily into place, and we didn’t have any problems installing it correctly each time. You simply have to place the car seat on the stroller and give it a gentle push and it gets installed with a click sound. Removing the car seat is as easy as installing it. You just have to press the release tab below the car seat and lift the car seat up. The car seat is a sure thing every parent will enjoy. Chicco does not offer any other adapter for this stroller, which limits your car seat options significantly. However, the Keyfit 30 car seat scored high in both safety and comfort than the stroller and hence, is a good choice for the car seat and stroller combo. 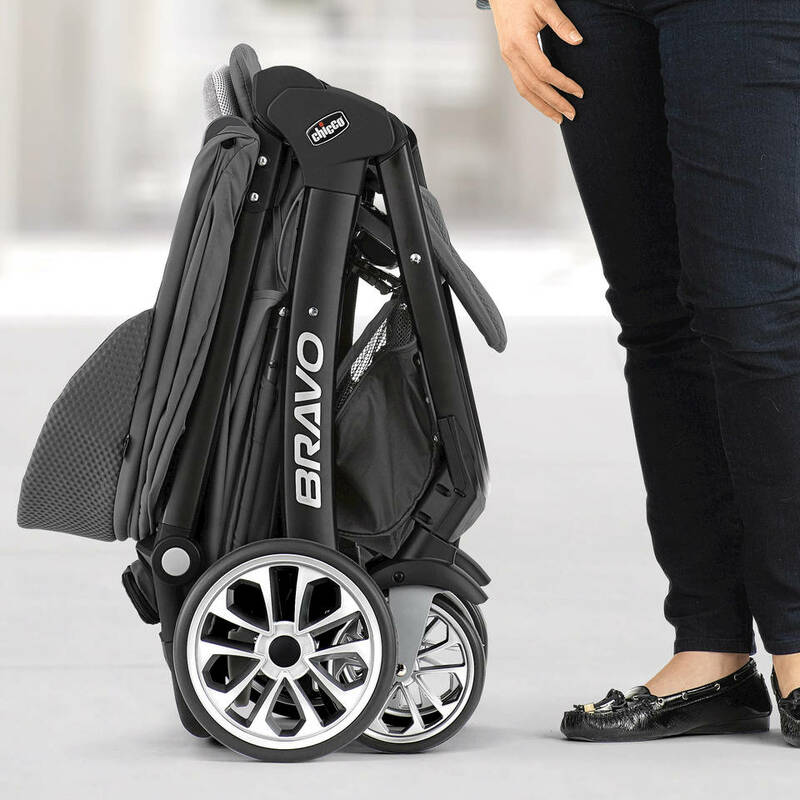 In its first mode for use with infants, Bravo functions as a lightweight car seat carrier. It’s easy to attach the adapter and click in the KeyFit. The car seat fits in even with the stroller seat installed. During the transition time when baby rides in the KeyFit but also likes to sit up in the Bravo, the KeyFit easily clicks in and out of the stroller seat, using the adapter. Many parents will be drawn to this stroller thanks to the popular Chicco name. It is compatible with the popular and award winning Chicco Keyfit 30 and can be purchased as a travel system. However, because it scored so poorly in our tests for maneuverability, it isn’t the best option no matter what parents are seeking in a stroller. In addition, many of the strollers in this review are compatible with the Chicco infant car seat or an adapter can be purchased to make it compatible. Parents can get a stroller that performed better in our tests than this one, which means there probably isn’t a best application for this stroller.